Looking for something unique to do for your childs party? Our Birthday parties might be your answer. 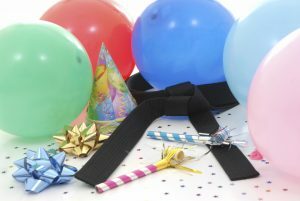 Our parties are held at the school and we take care of just about everything. We know birthday parties can be stressful, and we aim to take that stress out of them for you. We run a lot of parties, and we know how to make sure they go great and everyone leaves happy. Our all inclusive parties are just that, we take care of pretty much everything. All we ask you to do is hand out the invitations and bring the cake and a camera, that’s it. 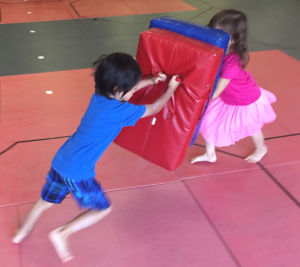 Your child will be treated to a high-energy Martial Arts class taught by two of our instructors where they get to play all their favorite martial arts games and be a “assistant instructor” for the day. Our parties are highly structured, and we will make sure that everyone has a blast. From the time they step in the door to the time they get picked up our instructors will be running the show. All you need to do is relax, watch and carry the cake in to your child. The guest of honor will enjoy cutting the cake with a samurai sword and each participant will receive a small gift from us as well. We will take care of everything, from occupying the kids while all the guests arrive to managing the group to ordering and serving the pizza. This party will be a stress free event that you can relax and enjoy. So what does a typical party look like? As the kids arrive we will keep them playing in the gym, getting warmed up and comfortable with the environment. Once we have everyone there we start right into our party, teaching a technique that leads to a game, then another technique leading to another game. The techniques and the games are all choosen to be age appropriate for the group. 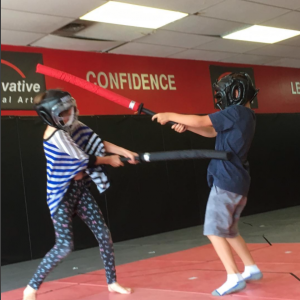 And of course no martial arts party would be complete without battling with foam swords. After a little over an hour of martial arts games and fun we break for pizza, making sure to have your childs favorite toppings available. We set up and serve, you get to relax. As the pizza eating is finishing up we will let you know it’s time to prep the cake and bring it in, after the kids help your child will get to cut it (with our assistance if needed) using a full sized sword! (You’ll want a picture of that 😉). Again, we serve and you can relax and eat cake as well. After the cake it’s time for a piniata (provided and stuffed by us). 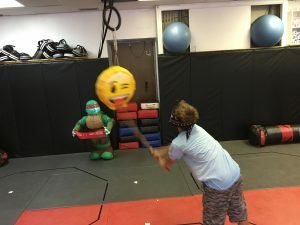 Being a martial arts school the only way to smash a piniata is with a wooden sword, something they get to keep as a souvenir. Finally it’s time for present opening! ring the cake and take pictures. You provide decorations, food, drinks, paper plates / utensils, loot bags, cake, etc. All you need to do is hand out invitations, bring the cake and take pictures. Please tell us a little bit about your childs interests (favorite shows / movies / hobbies / etc) so that we can customize the party better.